Impairment exists on a continuum from minimal to severe. It may be barely perceptible to us, yet our colleague may be endeavoring to mask and compensate for his/her stress, chronic pain, mental or physical illness or substance use disorder (SUD). Alternative-to-discipline (ATD) programs for impaired nurses are available in most states. The mission of these programs is to protect the public from unsafe nursing care through the voluntary cessation or restriction of practice by the impaired nurse. ATDs are confidential, therapeutic, nonpunative programs that offer the nurse a structured assessment, treatment and monitoring plan that facilitates successful rehabilitation and return-to-work. Authorize the release of participant information. to allow monitoring by the appropriate state agencies. 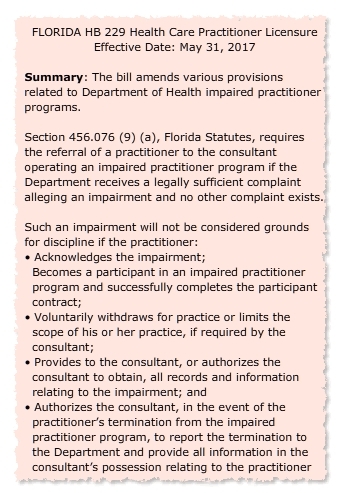 Voluntarily restrict, suspend practice or surrender license as recommended by the program or Board of Nursing. Enter and comply in good faith with an approved therapeutic rehabilitation program. Agree to a non-negotiable contract that requires completion of the ATD program in lieu of disciplinary action. Acknowledgment of impairment is requried for acceptance into an Alternative to Discipline program. Impaired nurses should be aware that the Affordable Care Act (2010) requires most individual, small group and large group insurance policies to cover SUD and mental illness treatment to the same extent that they cover treatment for other chronic diseases, like diabetes or cancer, but there are variations among states. Medical Detox - monitoring and medical support during substance withdrawl. Residential treatment - inpatient treatment and 24/7 monitoring of clients whose withdrawal symptoms are stabilized. Intensive outpatient program - treatment several hours a day, several days a week. Motivational Interviewing - collaborative, therapeutic conversation to strengthen the client’s motivation and commitment to change that is consistent with the client’s values. Cognitive Behavioral Therapy - encourages critical examination and phasing out of recurring destructive thoughts. Rational Emotive Behavior Therapy - helps replace destructive thoughts and convictions with healthier, adaptive thoughts. Dialectical Behavioral Therapy - skill building to regulate destructive behaviors arising from intense emotions. Eye Movement Desensitization and Reprocessing - concentrates on dual focus of attention with alternate bilateral visual, auditory and/or tactile stimulation to facilitate the resumption of adaptive information processing and integration. Seeking Safety - builds safe thinking coping skills and grounding techniques. Outpatient program - onsite individual and/or group therapy for about an hour, 1-2 days a week. Support groups that address issues related to the process of recovery/rehabilitation, professional issues and re-entry to the workplace. Recovery from alcohol addiction through a 12-step program including regular attendance at group meetings. Recovery from cocaine addiction through a 12-step program including regular attendance at group meetings.